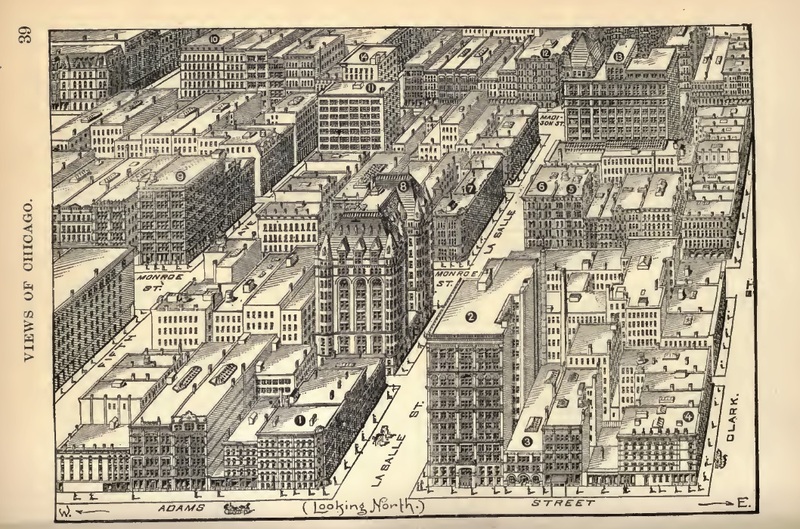 April 21, 1901 – A huge iron tank breaks from its supports on the roof of the Galbraith Building on Madison Street and smashes through six floors to the basement. Seven people are injured, none of them seriously, and all the glass on the Madison Street side of the building is broken. Two crows are killed in the Slotkin Pet Store on the ground floor. Fortunately, the accident occurs on a Sunday. There was no warning, and if the tank had fallen on any other day of the week, casualties would have undoubtedly been far greater. The tank had been installed a month earlier to supply water to the fire suppression system, and the water in the tank alone weighed almost six tons. Harry Solomon, one of the fortunate souls who escaped the tank’s fall, said, “The thing was over before we could realize our peril. A deluge of water and wreckage poured on us as we stood gazing into the great gap that had been cut through the floor not three feet from where I had stood. I knew in an instant that it was the tank, as we had spoken of the danger of installing the great weight in the old building. The whole building shook, and I thought there was no hope for us, but we rushed to the fire-escape to avoid going down with the floors.” [Chicago Daily Tribune, April 22, 1901] In the above plate from Rand McNally's 1893 View of Chicago the Galbraith Building is #10 at the very top of the rendering toward the right corner. 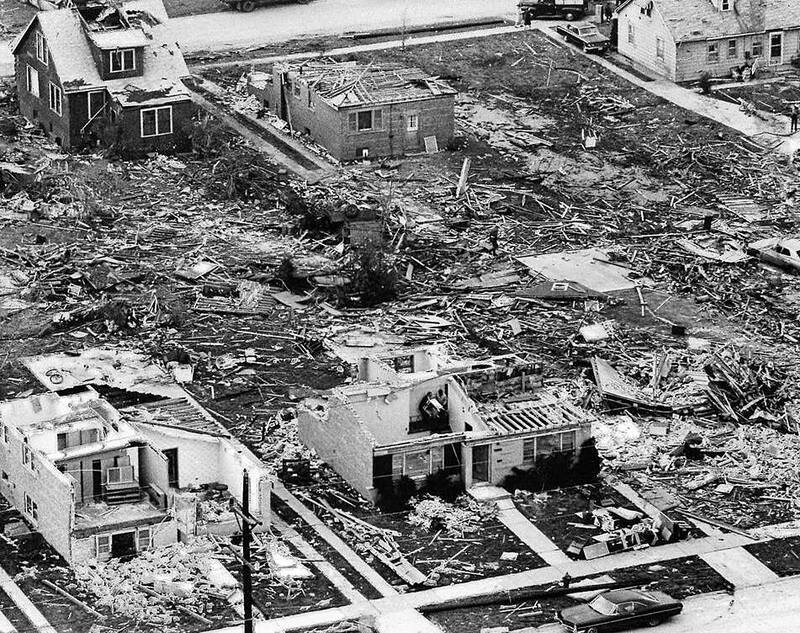 April 21, 1967 -- The third and final tornado to strike Illinois on this day begins northwest of Joliet at about 4:45 p.m. It moves east-northeast, building power and momentum as it goes. It takes six minutes for the monster funnel to carve a path of damage 16 miles long through the suburbs of Oak Lawn, Hometown, and Evergreen Park. At the intersection of Ninety-Fifth Street and Southwest Highway it throws several dozen cars stopped in traffic off the road, and sixteen people are killed at just this one location. The south end and east wall of Oak Lawn High School are destroyed at 5:26 p.m. when the school clocks stop. With winds of over 100 m.p.h., the tornado finally blows itself out over the lake off Rainbow Beach. Even though it is no longer on the ground, it still has enough power to pop windshields out of cars parked at the Filtration Plant at Seventy-Eighth Street and the lake. The disaster is immense -- 33 people lose their lives, and over 1,000 suffer injuries. 152 homes are totally demolished, and another 900 or more are damaged. 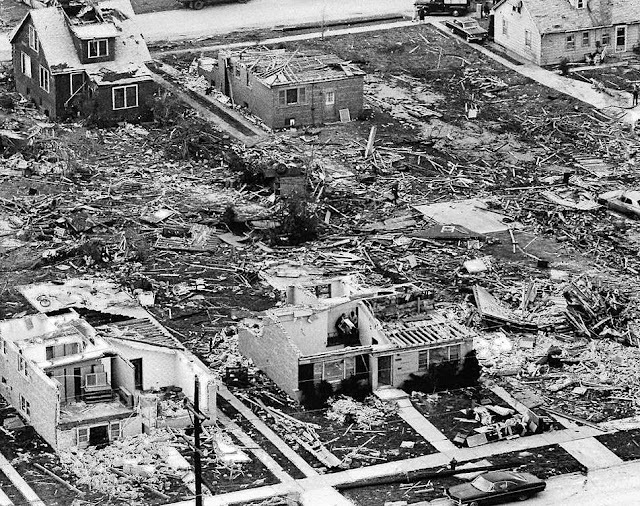 In its analysis of the tornado the National Weather Service concludes, "Most of those killed were people who were not in a position to hear the warning because they were away from home. Actually, the tornado could hardly have come at a worst [sic] time of day or week to catch the greatest number of people out in the open."